Day 157 (10/12/18) - Official fix found to be incomplete, further micropatches created and distributed, Microsoft notified. Jet is only supported in 32-bit, which means that a 64-bit application tricked into accessing a malformed data source file will not be exploitable. Indeed, double-clicking ZDI's poc.js on 64-bit Windows results in an error message; in order to launch poc.js on a 64bit machine one needs to use the 32-bit wscript.exe by launching c:\windows\SysWOW64\wscript.exe poc.js. 6b881234 89b48174050000 mov dword ptr [ecx+eax*4+574h],esi ds:002b:0083da8c=???????? For anyone with some mileage in reverse engineering, the instruction causing the exception indicates that the code is accessing an indexed element in an array containing 4-byte elements, whereby the array starts at ecx+574h and the index is in eax (which contains 2300h). And it's clear that the index is beyond the array's limits. In tracking the index value 2300h, we found that eax was read from address esi+24h a few instructions back. We then used !heap to find out who allocated it and set an access breakpoint to see who wrote this value there. That turned out to be function Index::Restore, which is called a couple of instruction earlier in TblPage::CreateIndexes. What happens there is value 2300h is copied to the location we're watching with our access breakpoint from address pointed to by edx. And edx at that moment points to the memory-mapped copy of the malformed data source file. So we found out that the malformed value 2300h comes directly from the PoC file group1, specifically at offset 1257h. Furthermore, looking around the code for additional uses of this user-provided index, we found one case immediately after the crash location, so whatever we'd do we'd need to make sure that this second use wouldn't also cause problems. An obvious solution to fixing both uses of the malformed index was to check the index immediately after it gets copied from the memory-mapped file (i.e., right after the call to Index::Restore), and setting it to some safe value in case it was out of bounds. But in order to check the bounds we'd need to know the bounds. Using !heap on ecx at the point of crash we inspected who allocated the memory block from which the PoC has escaped, and how large that block was. We found it to be a fixed-size block of 778h bytes, most likely a C++ object containing a fixed-size array of 4-byte elements. But how many elements? Let's calculate: the array begins at offset 574h in the memory block, and ends at most at offset 778h-1. The difference between the two means there is at most 204h bytes in the array, and dividing that by 4 (bytes) we get 81h elements, meaning that valid index values are between 00h and (at most) 80h. Note that we say "at most 80h" - at this point we can't know whether the entire space between offset 574h and the end of the memory block is reserved for the array (although it surely seems so), we just calculated the bounds for preventing the offending instruction from escaping the memory block. And we'll be okay with this for now: we'll prevent an exploit from overwriting heap management data or other objects allocated on the heap, which will take most (if not all) of the leverage from the attacker. cmp dword [esi+24h], 0x80 ; is the index lower than or equal to 0x80? We initially wrote this micropatch for Windows 7, and had a candidate ready just 7 hours after ZDI had published their PoC. After attempting to port it to other supported Windows versions, we noticed that almost all of them have the exact same version of msrd3x40.dll - which meant the same micropatch would apply to all these systems. The only Windows version with a different msrd3x40.dll was Windows 10: peculiarly, both DLLs had the same version and exactly the same size, but plenty of small differences between the two (including the link timestamp). The code was exactly the same and in the same place though (probably just a re-build), so we could actually use the exact same source code for the micropatch, just a different file hash. These two micropatches for a published 0day were then issued less than 24 hours after the 0day was dropped, and distributed to our users' computers within 60 minutes, where they were automatically applied to any running process with vulnerable msrd3x40.dll loaded. Which nicely demonstrates the speed, simplicity and user-friendliness of micropatching when it comes to fixing vulnerabilities. In fact one of our goals with 0patch is to make vulnerability patching so fast that attackers won't even manage to develop a reliable exploit for a public vulnerability, much less launch a campaign with it, before the vulnerability is already patched on most users' computers. What a goal, huh? How Can You Get These Micropatches, And What To Do Next? These micropatches are completely free for everyone, and can be obtained by installing and registering 0patch Agent from https://0patch.com. 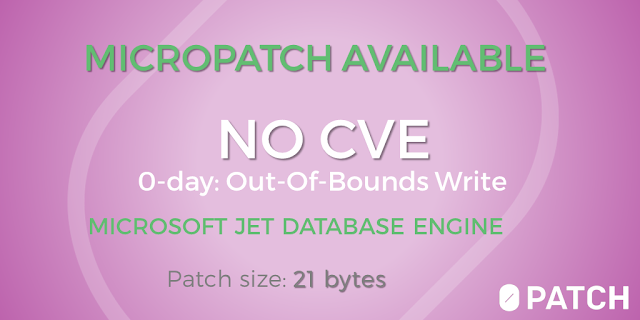 They will prevent exploitation of this 0day as long as you have the latest Windows updates applied (we did not port them to older Windows updates, but if you have a need for that you can contact us at support@0patch.com). Once Microsoft issues their official fix (likely on October Patch Tuesday), you will simply apply that update and these micropatches will automatically get obsoleted without you having to do anything else. As expected, Windows Update has just brought the official patch for CVE-2018-8440 today, a patch that would replace our "unofficial" micropatch we've issued 13 days ago. To quickly refresh your memory, 15 days ago security researcher SandboxEscaper published details and proof-of-concept (POC) for a "0day" local privilege escalation vulnerability in Windows Task Scheduler service, allowing a local unprivileged user to change permissions of any file on the system. The next day, we at 0patch have analyzed the vulnerability and prepared a "micropatch candidate" (a micropatch that blocks the POC but needs to be tested for functional side effects). We published the micropatch for Windows 10 version 1803 the day after, and subsequently ported this micropatch to a number of other Windows versions. Obviously, correcting someone else's code is not to be taken lightly (especially if that code is running on millions of computers), and not having the source code doesn't make it any easier. However, our team of security researchers and the growing community of experts who want to get their vulnerabilities fixed as quickly and efficiently as possible, are doing just that. In this particular case, our analysis showed that a call for changing permissions of a file, made from Task Scheduler's code, should have been impersonated - but it wasn't. We corrected that by making a call to RpcImpersonateClient right before the call, and another call to RpcRevertToSelf right after it. Pretty basic stuff. And it worked. Our micropatches are sometimes very similar to official patches (at least functionally speaking), and other times very different; not surprisingly, there is always more than one way to skin a cat - or to fix a vulnerability. So when the official patch from Microsoft came out today, we were naturally curious as to how they fixed it. The first thing we noticed was that the Windows Update replaced schedsvc.dll with a new version. Promising - this is the exact DLL we had micropatched. Next we ran BinDiff to compare the new and the old version. Even more promising - the only modified function was RpcServer::SetSecurity, which is the very function we had micropatched. And finally, BinDiff showed the exact difference between the old and the new version of this function. Let's take a look at that (note: the diff is for 64bit Windows 7). As you can see, Microsoft's official patch is functionally identical to our micropatch. We could say that this official patch delivers Microsoft's unofficial confirmation that our approach to patching this vulnerability - in a complex closed-source product - was also optimal from their perspective. That's very positive feedback for us and a great case for "unofficial" 3rd-party micropatches. Don't get carried away, however! There have been, and will be cases where a 3rd-party micropatch will fix a vulnerability differently and less well than the official vendor fix - or even break a thing or two. While we're doing our best and leverage our advantages (agility, instant patch deployment, instant patch removal), original product developers will always have advantage in their knowledge about the product and its environment, and their code fixes will be preferred. Nevertheless, our mistakes are much easier to remedy than those delivered in a 300MB package that requires a reboot both to install and uninstall. When a micropatch needs to be revoked, it takes just a few minutes for us to do that, and within an hour all online agents stop applying it without interrupting users in the slightest. And an improved version of the micropatch can later be delivered just as easily. In any case, if you have installed 0patch Agent to micropatch this vulnerability on your computer(s), it is now time to let the official fix take over. 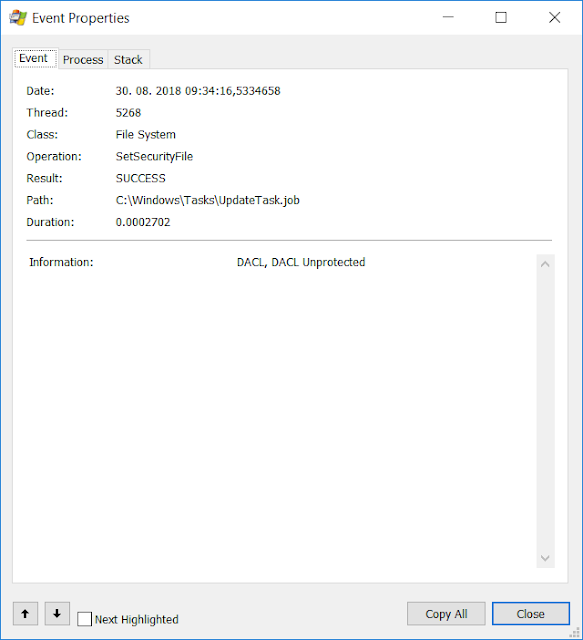 To do that, you simply apply today's Windows Updates and as soon as they replace the vulnerable schedsvc.dll, our micropatch will automatically stop applying because the cryptographic hash of the DLL will no longer match that associated with the micropatch. You don't have to do anything else; this is 0patch being a good citizen and stepping aside when it's no longer your best option. [Update 9/11/2018] Official fix for this vulnerability is now available and users are advised to apply Windows Updates, which will automatically result in our micropatch not getting applied any more. You're welcome to read about our comparison between our micropatch and Microsoft's official fix. Earlier this week security researcher SandboxEscaper published details and proof-of-concept (POC) for a "0day" local privilege escalation vulnerability in Windows Task Scheduler service, which allows a local unprivileged user to change permissions of any file on the system - and thus subsequently replace or modify that file. SandboxEscaper's documentation properly identifies the problem being in Task Scheduler's SchRpcSetSecurity method, which is externally accessible via Advanced Local Procedure Call (ALPC) facility. This method, which can be called by any local process, sets a desired security descriptor (sddl) on a task or folder, i.e., on a provided file path (path). SandboxEscaper noticed that this method fails to impersonate the requesting client when setting the security descriptor, which results in Task Scheduler changing the access control list of the chosen file or folder as Local System user even if the user calling this method is a low-privileged user. Impersonation is a feature where, to put it simply, a process running as user A gets a request for some action from user B and performs this action disguised as user B, borrowing user B's permissions for that. Task Scheduler is such a process running as user Local System, and when some other user calls its SchRpcSetSecurity method, it should impersonate the caller to perform the file operation using their identity - but apparently it doesn't, and uses its own powerful permissions to do so. trigger the Print Spooler service to load and execute the modified PrintConfig.dll using its own Local System identity. Task Scheduler being willing to perform SchRpcSetSecurity on a hard link. 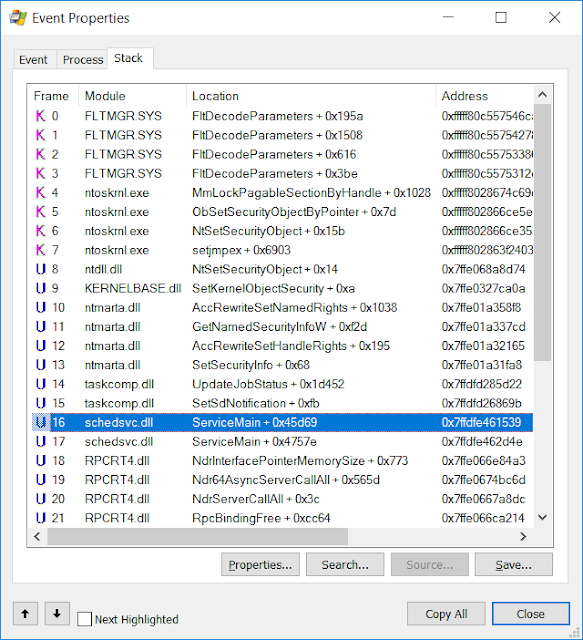 Okay, there's schedsvc.dll (Task Scheduler's executable) making a call to taskcomp.dll (Task Scheduler's helper library), which ends up with a call to kernel's NtSetSecurityObject. 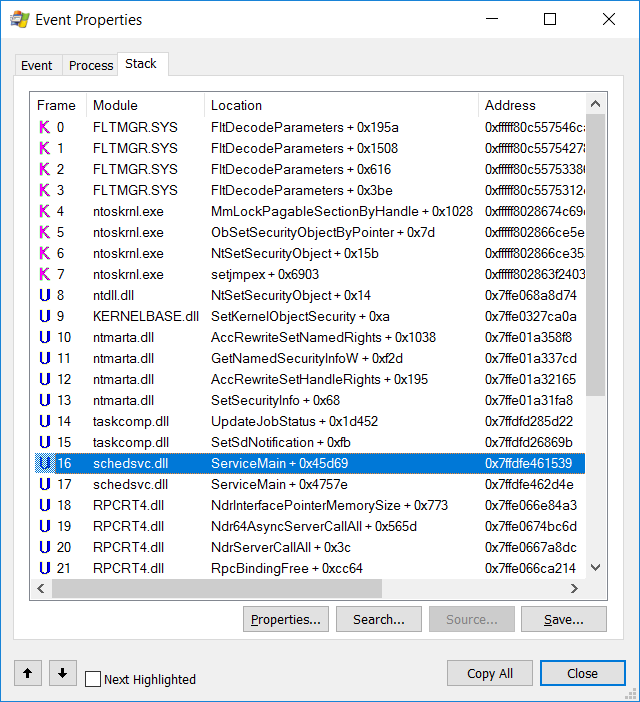 So we disassembled schedsvc.dll and taskcomp.dll to see what's going on in there at the identified locations. What we found was interesting. We were expecting to see code without any impersonation here, but actually found impersonation being used - just that the call that sets file permissions is done before the impersonation (in the lowest code block) begins. The plan was clear: let's begin impersonation before the offending call to make sure that said call will be impersonated. So we created a micropatch with a single patchlet containing a call to RpcImpersonateCient and placed it at the beginning of the block preceding the orange block. How about reverting the impersonation? It turns out that wasn't needed because all code execution paths were leading directly to another impersonation call without making any other kernel calls that might be affected by our impersonation. We tried this micropatch, but the exploit still worked !?! What was going on? It turned out that there is another permissions-setting call in function RpcServer::SetSecurity, possibly a fallback mechanism in case the first one failed. So we made the first one fail, and the second one came to the rescue - again without impersonation (the middle orange block). In this case, we can see a call to RpcRevertToSelf right before the offending call, which means that previous impersonation was reverted too soon to include the said call. What we did here was remove the premature RpcRevertToSelf call and insert a replacement RpcRevertToSelf call to the code block following the offending call. While this block has many other branches leading to it, we checked that these are not impersonated which means our inserted call won't erroneously prematurely revert some other impersonation. You can see the "Impersonating" line, proving that we have successfully forced Task Scheduler to impersonate the calling user when trying to set permissions on UpdateTask.job. Now, since this file was a hard link to another file which our user had insufficient permissions to modify ACL for, the result was ACCESS DENIED, as it should be. This video shows our micropatch in action. Q: Which Windows versions does this micropatch apply to? [Update 9/6/2018] Big thanks to Will Dormann for confirming the vulnerability as well as effectiveness of our micropatch on Windows Server 1803 in a real-time Twitter DM session! We can quickly port the micropatch to other affected versions but we'll only do that on request (support@0patch.com). As far as we know at this point, the vulnerability was confirmed to also be present and exploitable on 32bit Windows 10 and 32bit Windows 7, so it's safe to assume that at least all Windows versions from Windows 7 and Windows Server 2008 are likely affected. 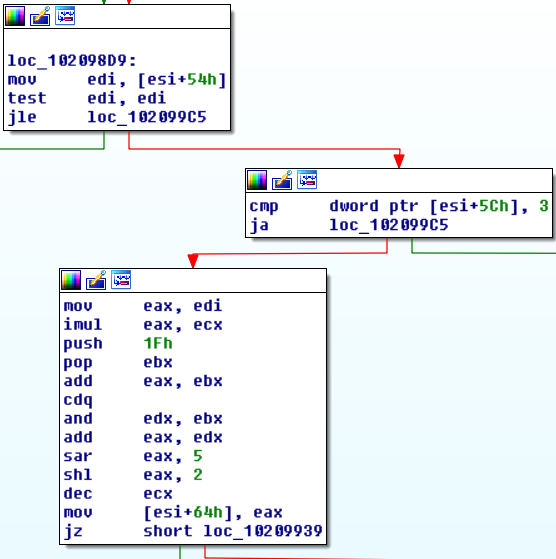 Q: Will modifying the exploit allow attackers to bypass this micropatch? Q: How do we apply this micropatch? If you have 0patch Agent already installed, this micropatch is already downloaded and applied so you don't have to do anything. Otherwise, download and launch the 0patch Agent installer, create a free 0patch account and register the agent to that account. You will immediately receive all micropatches including this one, and it will automatically get applied to Task Scheduler. Q: Is this patch functionally identical to how Microsoft will fix it? Obviously we can't know that. As we always claim, the original vendor - with their internal knowledge of the product - is best-positioned to correct their own code. Nobody else knows all the possible side effects of a code change as well as they do (granted, with large products even they often don't see everything) and in an ideal world software vendors would be issuing micropatches like this to quickly and painlessly fix vulnerabilities. That said, Microsoft may do the same as we did, but they may also prevent Task Scheduler from changing permissions on hard links. Or they may find that they need to support hard links and not impersonating the user is essential for some other operation that Task Scheduler performs - and will make a substantial code change. We often create micropatches after the vendor has issued the official update, which allows us to see what they did and ideally replicate their logic in a micropatch. With a 0day, this is obviously not possible. You should therefore consider our micropatch a temporary solution while waiting for the official fix. Q: What will happen on Patch Tuesday? When Microsoft makes their official fix available, you simply apply it as you would if you had never heard of 0patch. Applying it will automatically obsolete this micropatch on your computer as the update will replace a vulnerable executable with a fixed one, thereby changing its cryptographic hash. Since our micropatches are associated with specific hashes, this will make the micropatch inapplicable without intervention on either your end or ours. Q: Can we keep using this micropatch instead of applying Microsoft's update? Q: How can you provide a micropatch so quickly compared to original vendors? Software vendors know their products much better than we do, and are likely to create a more comprehensive code fix than we can without their knowledge and source code. That takes more time than writing a micropatch. Software vendors bundle numerous fixes together in a "fat update" that replaces entire executables, which requires a lot more testing across the board. We test our micropatches with focused tests targeting only the patched code. "Fat updates" are a huge problem for users and vendors when something goes wrong, which is why software vendors are even more wary of issuing a defective update. Of course a micropatch also can be flawed, but it can be revoked remotely and instantly replaced with a corrected version without users ever noticing anything. That said, we will always have "fat updates" for substantial functional changes, we're just arguing that we may not need them this frequently because most vulnerabilities could be patched with micropatches. Software vendors must issue patches for all supported versions, and extensively test all of them. We currently only have this micropatch for two three four six seven affected Windows versions. Nevertheless, porting to other versions, basic testing and deployment would take us about two hours of effort for each additional version, so that could still be done in one day. All that said, comparing our speed with software vendors' must also account for the difference in our deliverables. A micropatch can be quickly created, deployed to all computers in a hour's time and applied without even the slightest disturbance to users. But it must be considered a temporary security measure until the official patch can be applied. Q: What should we do if we encounter problems with Task Scheduler after applying this micropatch? Obviously we can't guarantee that our micropatch won't cause some unwanted side effects, e.g., with non-admin users editing existing scheduled tasks under certain circumstances. (Then again, software vendors can't guarantee that either.) The rule of thumb for using 0patch (or any other 3rd party behavior-changing product like antivirus or malware blockers) should be to first disable the agent and see if the problem persists, before contacting the original software vendor for the affected product. If the problem persists, the culprit is unlikely to be the micropatch. If the problem goes away, it's probably us and we'd like to hear from you at support@0patch.com. 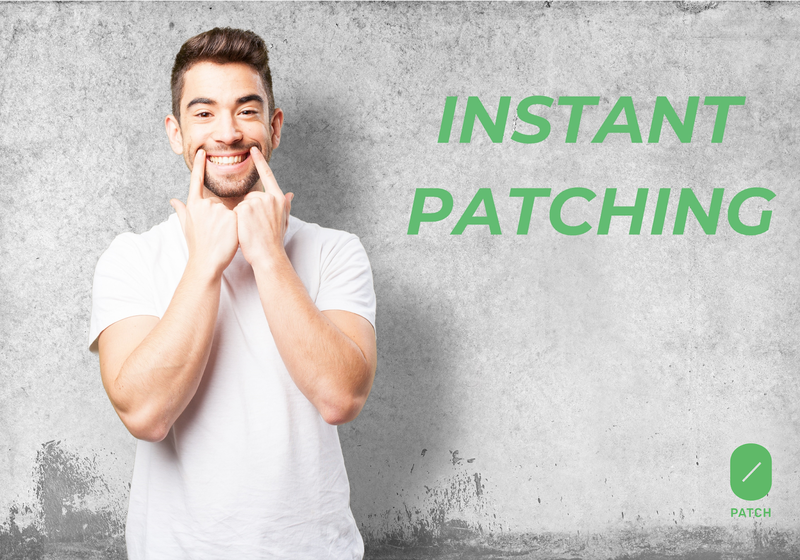 Fortunately, in contrast to standard "fat update" patching that software products employ today, 0patch allows you to instantly revert a patch with a click of a button. In April, Steven Seeley of Source Incite published a report of a vulnerability in Foxit Reader and PhantomPDF versions up to 9.0.1 that could allow for remote code execution on a target system. Public release of this report was coordinated with an official vendor fix included in the April's Foxit Reader and PhantomPDF 9.1. release. 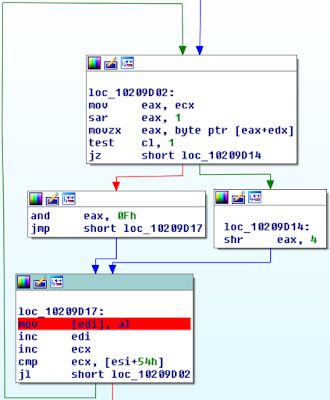 According to our analysis the PoC attached to the report triggers a heap-based buffer overflow in a Bitmap image data copy operation inside ConvertToPDF_x86.dll module using an overlong biWidth attribute. When dropping SRC-2018-0009.bmp into Foxit Reader we immediately got a crash and inspected it by hooking WinDbg with Page Heap enabled. 5f5f9d17 8807 mov byte ptr [edi],al ds:002b:15dc2000=?? But the loop of the copy operation is constrained by checking biWidth (at esi+54h) which is read from Bitmap image header. So why is there an access violation despite this check? When inspecting that buffer's properties something stuck out: an unusually small buffer size was reported by !heap to have been allocated, specifically just 4 bytes (UserSize in the WinDbg output below). Inspecting SRC-2018-0009.bmp in a hex editor revealed that biWidth is set to a huge value of 40000001h - a remotely controllable attribute in case the image used in conversion to PDF was obtained from the attacker. So if biWidth was used in calculation of destination buffer size before buffer allocation, that calculation was probably prone to integer overflow in order to result in so much lower a value (4). Besides heap block properties, !heap also printed out the buffer allocation call stack. We inspected that and indeed we found an overflow-prone buffer size calculation right before the orange-marked return address in the above call stack. The code graph below shows only a part of the vulnerable execution path, but the omitted code is very similar so it suffices for our explanation. There are three code blocks; edi represents biWidth read from image data in the first block, in the third block eax is the destination buffer size to be allocated, ecx represents biBitCount (number of bits per pixel). cmp edi, 03ffffffh      ; is edi<(7fffffffh-1fh)/20h? When this patch is applied to Foxit Reader's memory, the first two instructions from the top code block above (mov edi, [esi+54h] and test edi, edi, making up exactly 5 bytes) are replaced by a 5-byte jump to the patch code, forcing us to repeat the first instruction (mov edi, [esi+54h]) at the beginning of our patch code if we want to inject our code between the two instructions. 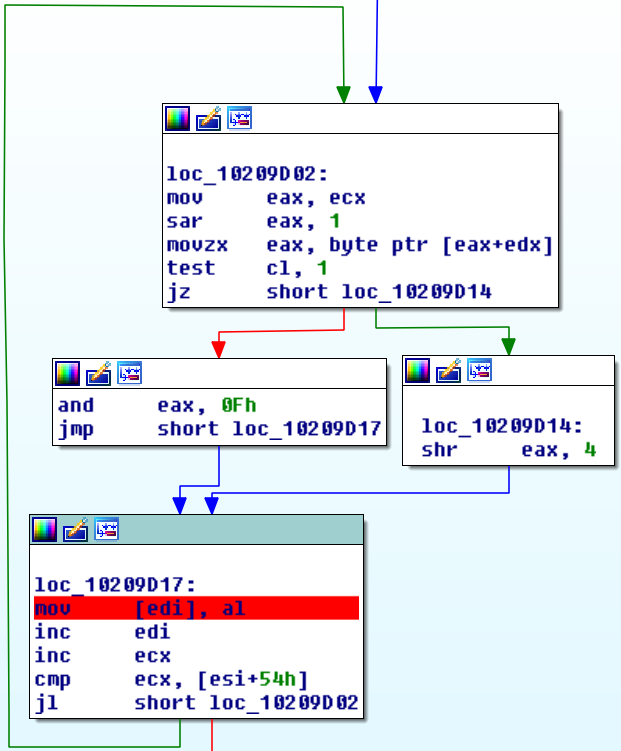 The second instruction (test edi, edi) is automatically placed after the patch code by 0patch Loader because JUMPOVERBYTES 3 directs it to only omit the first instruction (3 bytes) while keeping the remaining 2-byte instruction. This micropatch has already been published and distributed to all installed 0patch Agents. 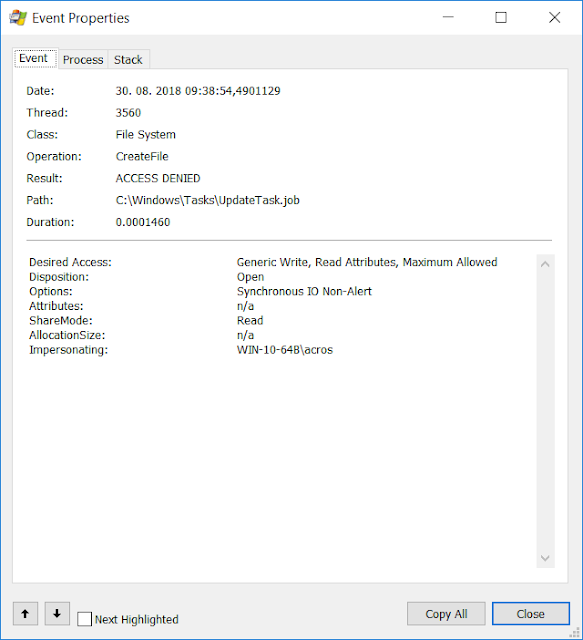 If you're using Foxit Reader or Foxit PhantomPDF version 9.0.1.1049, you can download our free 0patch Agent, create a free 0patch account and register the agent to that account to immediately receive this micropatch and have it applied to your Foxit software. 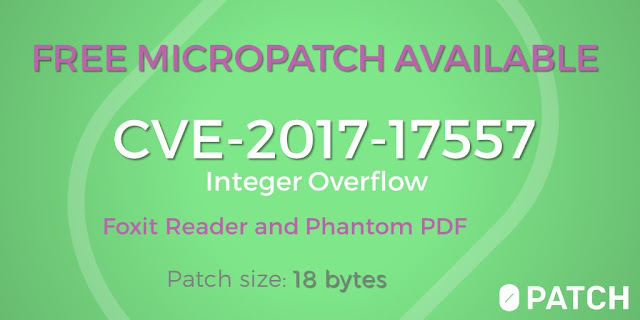 If you're using some other version of Foxit Reader and would like to have micropatches for it, please contact us at support@0patch.com. 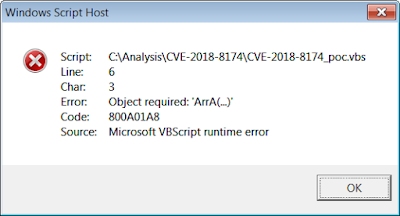 Last week, Microsoft issued an update resolving (among others) a critical remote code execution issue in VBScript Engine named CVE-2018-8174, exploit for which has previously been detected in the wild. Unfortunately, Microsoft's update breaks networking on some computers (details below), prompting users to avoid their application. Windows updates are "all or nothing" these days, so users can't just remove a defective KB and enjoy the protection provided by other KBs issued on the same Patch Tuesday. Fortunately, micropatching provided by 0patch is the exact opposite of that, addressing each vulnerability individually. Let's start with the exploit and the underlying vulnerability. By simply saving the above code to poc.vbs and double-clicking it on a Windows computer without May 2018 updates installed, we trigger the vulnerability and get wscript.exe to crash in oleaut32.dll's VariantClear function . Let's see what goes on here. We create two fixed-size arrays ArrA and ArrB with one element each. A ClassVuln object is created and assigned to the first element of the ArrA array, then the ArrA array is erased. There is just one element in the array, namely the ClassVuln object, and Erase sets ArrA(0) to Nothing, which removes all references to the object and triggers its destruction. In our Class_Terminate, the first element of ArrB is set to ArrA(0) - but wait, ArrA(0) is the very object being destroyed, and you can imagine where this is heading. This assignment increases the reference ("lock") count for the object, but the following instruction (ArrA(0) = 31337) decreases the same reference count, which will lead to the object being actually destroyed. However, after being destroyed, there will still be a reference to this object in ArrB(0), which is called a "dangling pointer," i.e., a pointer to a memory block that has already been freed. In this case the object was allocated on the heap, so now ArrB(0) has a reference to some location on the heap, and those versed in exploiting "use after free" issues have a nice starting point to make use of this reference. We're not interested in exploiting this issue, however, but in patching it. To do that, we first need to understand the vulnerability. Kaspersky researchers pointed their fingers at the VBScriptClass::Release function, which only checks the object reference count before calling VBScriptClass::TerminateClass (this executes our Class_Terminate code), and doesn't account for the case where Class_Terminate would increase the object reference count. So even though the reference count was increased (by Set ArrB(0) = ArrA(0)), the object still gets destroyed. We're not sure that this is the (entire) root cause, although we would probably try to fix the issue using this avenue if we didn't have Microsoft's official patch that contains information on how they fixed it. The error states: "Object required: 'ArrA(...)'" in line 6, indicating that the assignment of ArrA(0) is not possible as ArrA is not an object (anymore). First we decided to compare code execution between the patched and the unpatched version using WinDbg's wt (trace and watch data) command. Fortunately symbols are available for oleaut32.dll so the traces looked fairly identical up to the point where the patched version "derailed" from the unpatched version's path towards crashing. It turned out the fork happened in function vbscript!AssignVar, executed as a result of assigning ArrA(0) to ArrB(0). In this function (which hasn't been modified by the patch), a test is being made on the vt (variant type) member of a VARIANT structure, which in our case denotes the ArrA(0) element. And it turns out on the unpatched computer, vt is 9 (VT_DISPATCH) while on the patched computer, it is 0 (VT_EMPTY). This means someone must have changed the value of vt from 9 to 0 along the way. In order to find out who did that, we placed an access breakpoint to the address of vt sometime earlier in the execution where it was still 9 on the patched computer. It was time for BinDiff. We compared the patched and the last unpatched version of oleaut32.dll (which is where the crash occurs), and looked at the modified functions. Unsurprisingly, VariantClear was slightly modified in several places (orange blocks on the image below). Three of these blocks set the vt (variant type) member of a VARIANT structure to 0, which means VT_EMPTY, or an empty object. Our PoC executes the middle orange block, and that block contains - in its patched version - the instruction that sets vt to 0. The old version with our micropatch has an identical reaction to our PoC as the new version. Our micropatches for this vulnerability have been labeled ZP-320 and ZP-321 for 32-bit and 64-bit version of oleaut32.dll respectively, and are applicable on Windows 7 and Windows 2008 Server updated up to April 2018 Windows updates. Why only these versions? Well, updates KB4103718 and KB4103712 are reportedly causing networking problems on some computers, which prompts users to delay their application - remaining vulnerable to the issue we have micropatched here. We have reports of Windows 7 and Windows 2008 Servers being affected, but if you or someone you know is experiencing this issue on other Windows versions, just ping us and we'll quickly port these micropatches. As always, if you have 0patch Agent installed, the above-mentioned micropatches should already be present and applied on your system. If not, you can download a free copy of 0patch Agent to protect your system from CVE-2018-8174 at least until Microsoft resolves the functional problems with their updates.